Marie Sharp's Belizean Heat Habanero Hot Sauce 10 fl.oz. 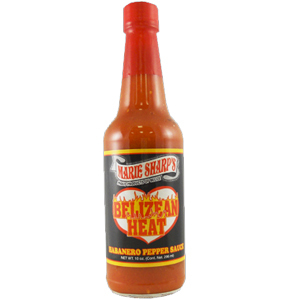 Marie Sharp's Belizean Heat Hot Sauce is especially blended for devoted heat seekers with great taste. Great for cooking. Flavor soups, sauces and stir fries or add boiled water for rice, pasta or boiled seafood. 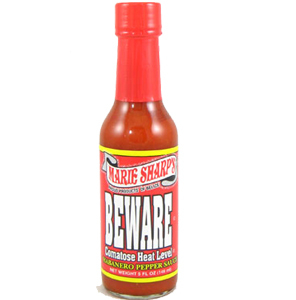 Marie Sharp's Beware Comotose Hot Sauce 10 fl.oz. Marie Sharp's Grapefruit Pulp Habanero Hot Sauce is the finest product of its kind. This unique grapefruit-based blend achieves the perfect balance between flavor and heat. Marie Sharp products the old-fashioned way: using the freshest vegetables and the finest ingredients. Her secret homemade recipe utilizes the potent red habanero pepper. 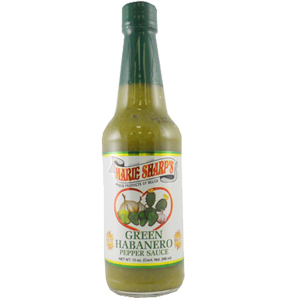 Produced in Belize, her red habanero is considered to be the hottest variety of pepper known to man..
Marie Sharp's Green Habanero & Prickly Pear Hot Sauce is a one of a kind sauce made from the Prickly Pear cactus sometimes called "Nopal" and is a high fiber sauce. A very popular and unique green sauce. 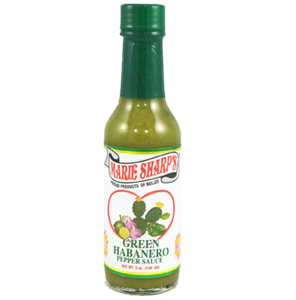 Marie Sharp's Green Habanero Hot Sauce with Prickly Pears 5 fl.oz. Nestled in the fertile foothills of the Mayan Mountains of Belize, Marie Sharp's factory still creates her sauce the old-fashioned way. She uses the freshest ingredients which include fiery red habanero peppers, carrots, onions and key lime juice, achieving a perfect balance of flavor and heat. One taste and you may feel like you're dining with an old friend. This is the original sauce that started the habanero craze that continues today. 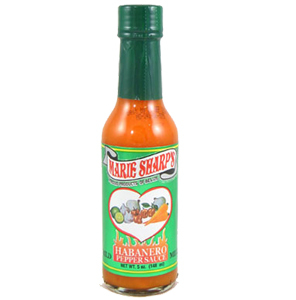 Marie Sharp's Mild Habanero Pepper Sauce is a milder version of the famous fiery sauce line from Belize. This unique carrot-based blend achieves the perfect balance between flavor and heat. Marie Sharp's Orange Pulp Habanero Hot Sauce is a special blend of yellow habanero peppers and fruity orange pulp, with just enough heat to compliment each unique flavor. Marie Sharp has once again created a wonderful citrus hot sauce. Marie Sharp's recipe utilizes the potent red habanero pepper. Produced in the fertile paradise of Belize, her red habanero is considered to be the hottest variety of pepper known to man; Marie has spent many years cultivating a habanero worthy of her recipe. Marie Sharp's Pure Mango Habanero Pepper Sauce is an AWESOME NEW sauce from the good people down in Belize!! 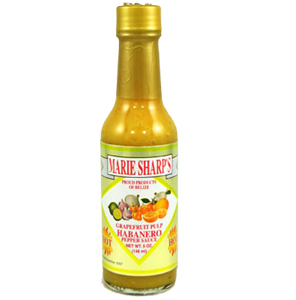 Enjoy outstanding MANGO flavor in this new Marie Sharp's PURE MANGO Habanero Pepper Sauce. 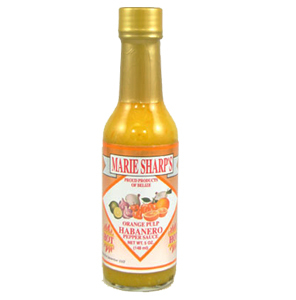 Marie Sharp's Habanero Pepper Sauce is the one of our best sellers and the finest product on the market. This unique orange-based blend has a perfect balance between flavor, heat and sweet! Marie Sharp's Sweet Habanero Pepper Sauce is a unique blend of choice fresh red habanero pepper pieces, onions, garlic, cilantro, sugar vinegar, lime juice and pectin. Great to add on grilled meats or to top a massive taco. From down in Trinidad and Tobago comes this scorching puree of blazing peppers. 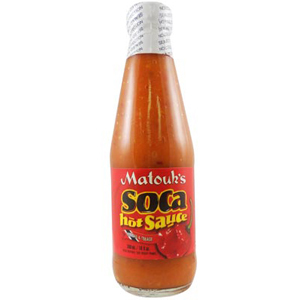 Matouk's Soca Hot Sauce is seriously hot, thanks to the aged, pickled scotch bonnet peppers that are the main ingredient in this thick and flavorful hot sauce. Matouk's Soca features the traditional mustard base and adds West Indian herbs plus cane sugar for authentic island flavor that complements the fiery heat from the scotch bonnet peppers.